Discover this amazing moroccan camp selected by Original Glamping for you. 35 kilometers from Marrakech, in the small stone desert of Agafay. The Scarabeo Camp siting affords stunning 360° views of the Agafay’s barren grandeur and beyond to the snow-capped Atlas mountains. Most of the activities offered by Scarabeo Stone Camp are designed for you to enjoy the great outdoors and breathtaking panoramas of the region. Marrakech is not far away, and so all the activities this enchanting city has to offer are within easy reach, and in some cases can even be relocated to the camp. 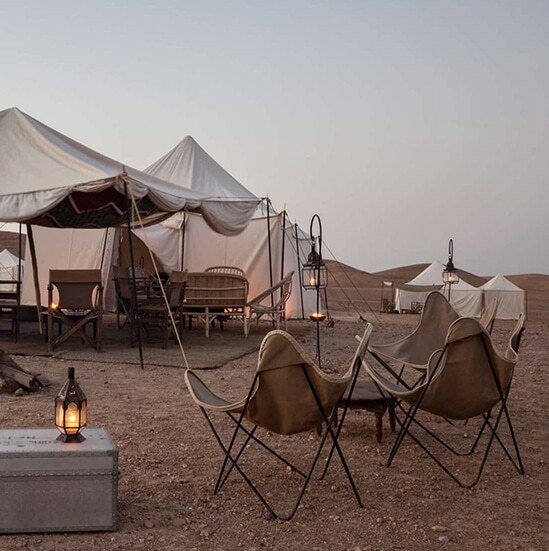 The Scarabeo “Stone Desert” camp has 7 Maure Standard Room/Tents and 6 Maure Suite/Tents (within 2 Family Suites) dotted throughout a vast terrain, lit by flickering lanterns.